Tony provided an update on current activities of the IASB affecting banks. Tony emphasised that the global transition to alternative reference rates will have broad and significant impacts for banks and corporates globally. He reminded the audience of some of the shortfalls of LIBOR that served as the catalyst for transition, notably the fact that LIBOR is not transaction-based. Tony discussed some of the most significant accounting questions in relation to the transition from IBOR to risk free rates (RFRs). The IASB is due to discuss whether to start a project to amend IFRS 9 at its December meeting. 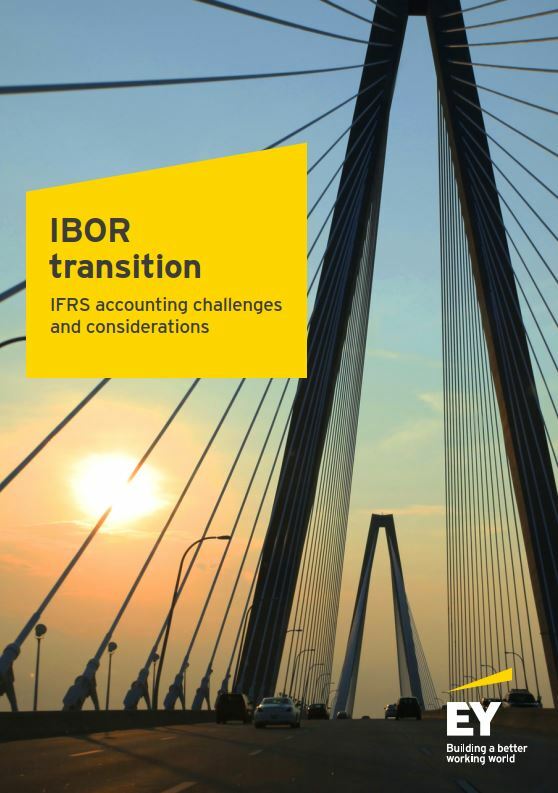 Depending on how the hedge is designated, determining if it is still possible today to consider that IBOR is a risk component of forecast variable cash flows beyond the date of transition to RFRs, or whether IBOR cash flows beyond that date are still highly probable. Whether hedge effectiveness beyond the transition date can be reliably measured. Whilst there is currently no definitive answer to these questions, the current consensus seems to be that IBOR is still a component of long term variable interest rates, that RFR cash flows beyond the transition date can be thought of as equivalent to IBOR ones and effectiveness is still measurable. But this will have to be closely monitored and reassessed as the transition develops and it is hoped that the IASB will provide some relief for continuity of hedge accounting when this logic is no longer persuasive. Will amending the hedge documentation to refer to an RFR result in hedge de-designation and re-designation? The implication of a de-designation and re-designation is that the new hedge relationship would include a derivative that has a non-zero fair value, which introduces a potentially significant new source of hedge ineffectiveness for cash flow hedges. Tony remarked that there is an expectation for the IASB to consider these questions as part of their project. Would amending a financial instrument to reference an alternative RFR be sufficiently substantial to result in de-recognition? And, if the change is not substantial, how is the modification of the rate accounted for, as the effective interest rate is required to remain the same, in accordance with IFRS 9.B5.4.6 (the successor to IAS 39 Financial Instruments: Recognition and Measurement, paragraph AG8)? Entities will have to exercise judgement to establish whether a change to the new benchmark would result in de-recognition. Given the nature of the change in benchmark, it seems unlikely that this would result in de-recognition in most cases, but it would help for the IASB to provide some guidance on the application of IFRS 9.B5.4.6 to this fact pattern. 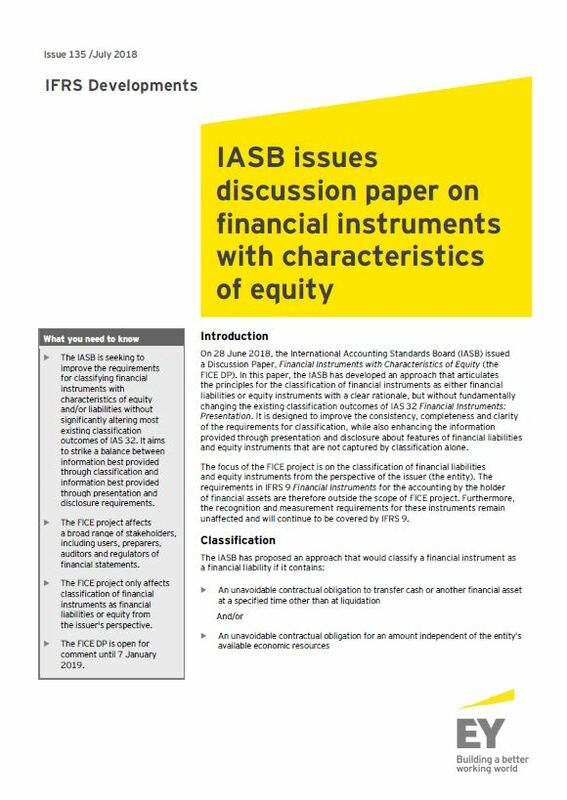 Tony reminded the audience that the IASB issued a discussion paper (DP), Financial Instruments with Characteristics of Equity, in June 2018. In this paper, the IASB has developed an approach that articulates the principles for the classification of financial instruments as either financial liabilities or equity instruments with a clear rationale, but without fundamentally changing the existing classification outcomes of IAS 32 Financial Instruments: Presentation. Applying this model, most bonds and cash-settled derivatives would be liabilities according to the timing feature, because of the obligation to transfer economic resources other than at liquidation. The amount feature mostly affects preference shares and equity-settled derivatives, discussed further, below. Tony made the observation that the classification model in the DP does not consider economic compulsion for the issuer and ignores any non-contractual statutory or regulatory requirements in making the classification assessment. The DP also sets out a new approach for presenting changes in the carrying values of certain liabilities on the face of the financial statements. Income and expenses, including fair value gains and losses on those liabilities that contain no obligation for an amount that is independent of the entity’s available economic resources, would be presented not in profit or loss, but in other comprehensive income (OCI), without recycling. This would include, for example, gains and losses on most put options on shares of non-controlling interests. Cumulative perpetual preference shares will be required to be classified as financial liabilities, even if they only pay a coupon, if the entity pays a dividend on its ordinary shares. This is a change to the presentation outcome for these instruments compared to applying IAS 32, in accordance with which, many obligations were classified as equity instruments. Non-cumulative preference shares which pay discretionary dividends with an obligation to pay a fixed amount at liquidation will now be treated as a compound instrument where the liability component is the obligation to pay a fixed amount of cash at liquidation and the equity component reflects the discretionary dividends. The DP suggests that, depending on the term and the discount rate, the net present value of the liability may be negligible. Furthermore, Tony suggested that if cumulative preference shares don’t pay interest on deferrals, then the liability for them may be negligible as well. However, if a preference share is callable, and the issuer expects to call the instrument, the liability should be measured by taking into account the timing of the call option and the value thereof, which may give rise to a significant liability. Tony then discussed the proposed classification principles for derivative financial instruments introduced in the DP. For equity settled-derivatives the fixed-for-fixed rule in IAS 32 is replaced by ‘the amount feature’. In practice this means an equity derivative is a liability if the net amount of the derivative is affected by any variable that is independent of the entity’s available economic resources. This means that a change in conversion rate due to time or anti-dilution would not be an issue under the new framework. However, the current exception under IAS 32 for foreign currency rights issues would disappear. The DP also proposes that changes in total comprehensive income will need to be attributed between the different classes of equity. Finally, the DP proposes more comprehensive disclosure requirements about features of financial liabilities and equity instruments that are not captured by classification alone. Tony suggested that the current approach in the DP may have some unintended consequences and challenges. He reminded the audience that the deadline for comments on the DP is 7 January 2019. Tony reflected on the dynamic risk management model, based on staff papers and the IASB discussion to date. A DP on the subject is expected to be issued in the second half of 2019. Discussions to date show that the core model is essentially a cash flow hedge accounting model. Tony suggested that changes in assumptions (e.g., prepayments) will result in imperfect historic alignment and new exposures can be added prospectively without affecting historic alignment. An economic relationship assessment will be required to ensure the cash flow hedge ‘lower of’ accounting is not abused and there will be some form of quantitative effectiveness assessment. The IASB are yet to discuss any operational practical expedients but Tony confirmed that it is on their agenda. The DP will also include more comprehensive disclosure requirements. Tony reminded the audience that in October 2018, the IASB issued amendments to IFRS 3 Business Combinations to update the definition of a business. The amendments are effective for annual periods starting on or after 1 January 2020. Tony explained that the new amendments state that an integrated set of activities and assets must include, at a minimum, an input and a substantive process that together significantly contribute to the ability to create output. Most notably, the presence of an organised workforce is not just an input but also an indicator of a substantive process. It was noted that a contract for an outsourced property or asset management may give access to an organised workforce. The new definition also includes an optional concentration test - if substantially all the fair value of what is acquired is concentrated in a single identifiable asset or group of similar assets, it is not a business. Tony concluded that these changes clarify the definition of a business to address diversity in practice. The IASB has not yet launched a project to deal with cryptocurrencies. A discussion by the IFRS Interpretations Committee tentatively concluded they are, by default, intangible assets or inventory if held for sale in the ordinary course of business. Holders of a crypto-assets will need to evaluate their own facts and circumstances in order to determine which accounting classification and measurement should be applied. 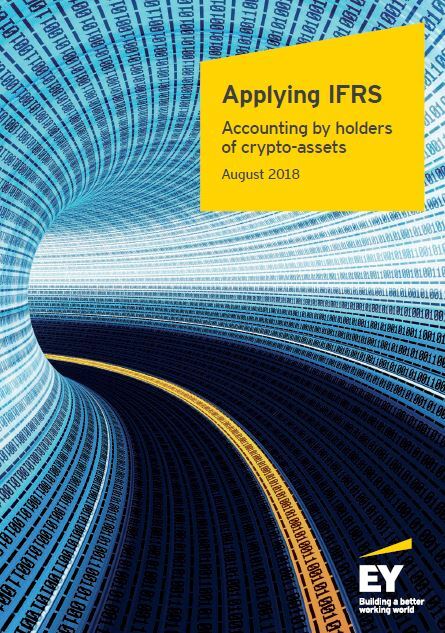 Notably, where the business model is to trade in cryptocurrencies, the broker/dealer exemption in IAS 2 Inventories may be applicable so that inventories can be recognised at fair value less costs to sell.